75th and Sedgwick: To Asuka... or not? The wine info is SO helpful! I agree with Melissa's comment, I'm going to load these suggestions onto my phone so they will be handy next time I find myself buying wine. Thank you, Jon! I was in Louisville this past weekend and spent lots of time with my parents talking about their new house. I'm in love. The open floor plan of the new house is very different from the center-hall colonial I grew up in, but I believe it to be just as fabulous. Not terrible, but soooo not fantastic. 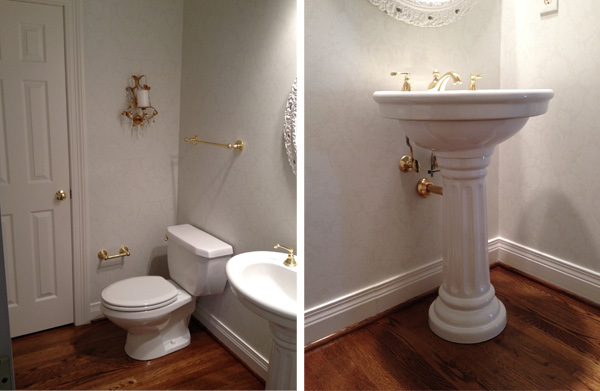 We're going to keep the sink and commode (I love that word), but replace all of the brass fixtures. Easy enough, right? I'm dying to put up some wallpaper. And I mean awesome and fancy wallpaper. I really wanna knock this room out of the park. You may not know this about me, but I believe very strongly that powder rooms should be fancy. 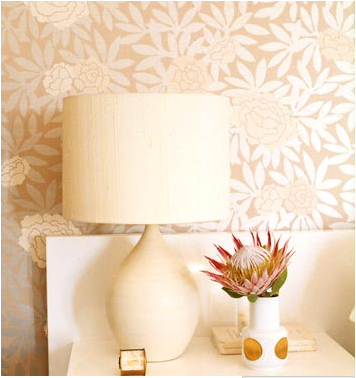 I brought a bunch of wallpaper samples home this weekend and below is the pattern my Dad hated the least. Osborne & Little's 'Asuka' by Nina Campbell. Isn't it devine? More photos of Asuka in use here and here. 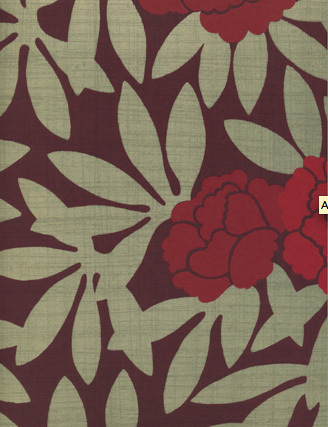 The pattern reminds me a lot of Oh Joy's Petal Pusher paper, but maybe a little more 'parents' if you catch my drift. My Dad is afraid that it will seem 'dated' too quickly, and I'm sure it will, but in the mean time it's delish, and it's such a small room, it will be easy to redo when the need arises. The Asuka isn't definite yet, but it's our top choice so far. I still need to do some pricing, and also send my parents all the different color choices. The colors are hard to read on a computer, but basically the leaves in each color way are metallic (yummy!). I was thinking we could pull out one of the colors and use that for the ceiling too. What do you think? Which would you choose? Aren't you excited to pee at Bill and Dee's! PS... My friend Annabelle showed me this video yesterday and we had a giggle.